It’s refreshing to see ingenuity unleashed from societal mores on an industrial scale. Why not add treads instead of wheels? Who says a home AC can’t work in a car? 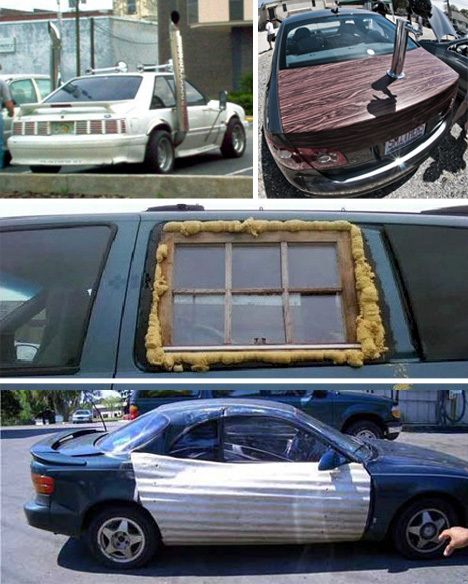 Vehicle modifications can be incredibly fancy. These are not. Have fun with the family car! As long as it works, it works, right? Vehicle repairs can be completed with items found around the house, or cars can be enhanced with mobile beer taps… Imagine that boring sedan freed from its boundaries. Mobile hot tubs are typically found on ultra-expensive limousines. Handy, down-to-earth types have learned how to reject the 1% by creating their own mobile masterpieces. Treads are cooler than tires. Nobody is contesting that. All the pain and effort required to replace a vehicles tire’s with these treads is totally worth the end result. Giant tires or tiny tires… they’re both fun. Nothing is more eye-catching than an extreme. 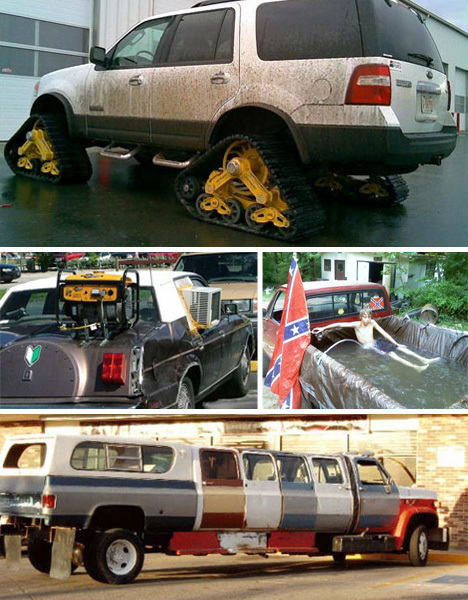 Take your car and kick it up a notch by upgrading those tired old rims to something outrageous. 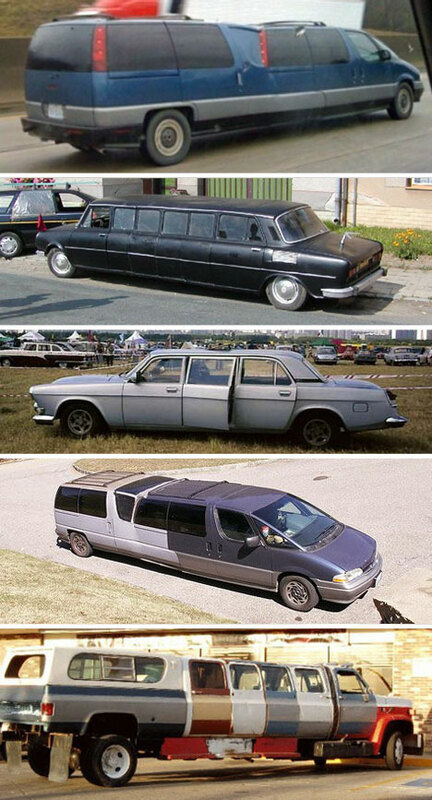 Limousines are not as posh as they used to be, huh? These fantastic do it yourself works of art are amazing. It’s tough to understand how these vehicles could possibly be street legal, however. 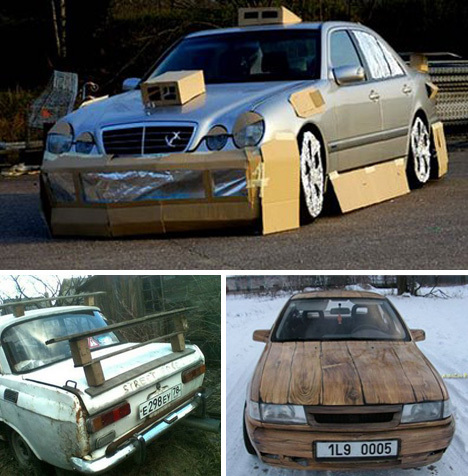 Wood, cardboard, and laminate flooring are just a few of the creative materials that ardent characters use to decorate their vehicles. 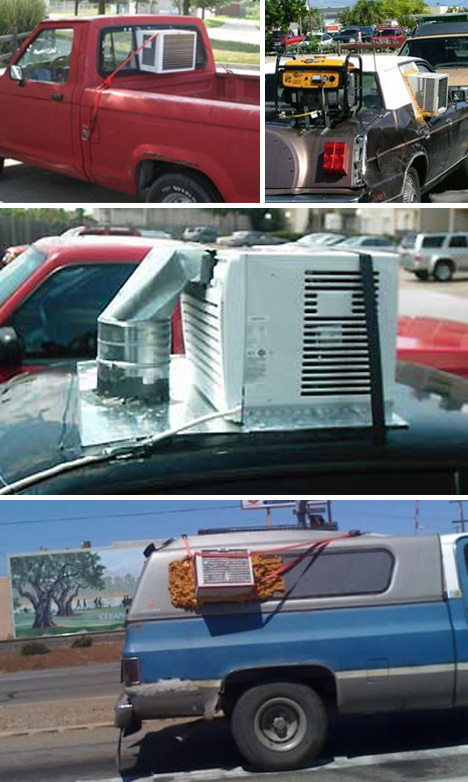 If the air conditioning unit works in the house, why wouldn’t it work in the car? It may not be the most elegant solution to hot summer days, but it sure helps! The truly green revolution gets 300 miles per hay bale.